Commonly used to put on mass and size while increasing strength. It leads to less water retention and estrogenic side effects. This special feature has two positive characteristics for the athlete. First, based on the special combination effect of the compounds, Sustanon, milligram for milligram, has a better effect than Testosterone enanthate, cypionate, and propionate alone. Second, the effect of the four testosterones is time-released so that Sustanon goes rapidly into the sytem and remains effective in the body for several weeks. Due to the propionate also included in the steroid, Sustanon is effective after one day and, based on the mixed in decanoates, remains active for 3-4 weeks. Sustanon has a distinct androgenic effect which is coupled with a strong anabolic effect. Therefore it is well suited to build up strength and mass. A rapid increase in body strength and an even increase in body weight occur. Athletes who use Sustanon report a solid muscle growth since it results in less water retention and also aromatizes less than either testosterone enanthate or cypionate. Sustanon is usually injected at least once a week., which can be stretched up to 10 days. The dosage in bodybuilding and powerlifting ranges from 250 mg every 14 days up to 1000 mg or more per day. Since such high dosages are not recommended and fortunately are also not taken in most cases the rule is 250-1000 mg/week. A dosage of 500 mg/week is completely sufficient for most, and can often be reduced to 250 mg/week by combining with an oral steroid. In order to gain mass fast Sustanon is often combined with Deca Durabolin, Dianabol (D-bol) or Anadrol while athletes who are more into quality prefer combining it with Parabolan, Winstrol, Anavar or Primobolan Depot. Although Sustanon does not aromatize excessively when taken in a reasonable dosage many people, in addition, also take an antiestrogen such as Nolvadex and/or Proviron to prevent possible estrogen-linked side effects. The side effects of Sustanon are similar to those of Testosterone enanthate (see also Testosterone enanthate) only that they are usually less frequent and less severe. Sustanon 250 is an oil-based injectable containing four different testosterone compounds: testosterone propionate, 30 mg; testosterone phenylpropionate, 60 mg; testosterone isocaproate, 60mg; and testosterone decanoate, 100 mg. The mixture of the testosterones are time-released to provide an immediate effect while still remaining active in the body for up to a month. As with other testosterones, Sustanon is an androgenic steroid with a pronounced anabolic effect. Therefore, athletes commonly use Sustanon to put on mass and size while increasing strength. However, unlike other testosterone compounds such as cypionate and enanthate, the use of Sustanon leads to less water retention and estrogenic side effects. This characteristic is extremely beneficial to bodybuilders who suffer from gynecomastia yet still seek the powerful anabolic effect of an injectable testosterone. Although Sustanon remains active for up to a month, injections should be taken at least once a week to keep testosterone levels stable. A steroid novice can expect to gain about 20 pounds within a couple of months by using only 500 mg of Sustanon a week. More advanced athletes will obviously need higher dosages to obtain the desired effect. Sustanon is a fairly safe steroid but it is probably wise to use an antiestrogen such as Nolvadex (tamoxifen citrate) or Proviron (mesterolone). Athletes interested in rapid size and strength gains find that Sustanon stacks extremely well with orals such as Anadrol (oxymetholone) and Dianabol (methandrostenlone). On the other hand, Sustanon also stacks well with Parabolan (trenbolone hexahydrobencylcarbonate), Masteron (drostanolone propionate), and Winstrol (stanozolol) for athletes seeking the hard, ripped look. 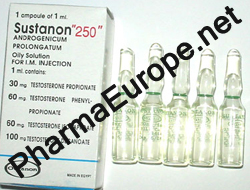 Sustanon 250 is an oil-based injectable containing four different testosterone compounds: testosterone propionate, 30 mg; testosterone phenylpropionate, 60 mg; testosterone isocaproate, 60mg; and testosterone decanoate, 100 mg. The mixture of the testosterones are time-released to provide an immediate effect while still remaining active in the body for up to a month. 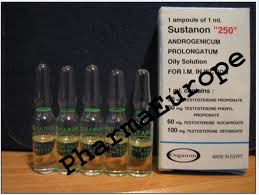 As with other testosterones, Sustanon is an androgenic steroid with a pronounced anabolic effect. Therefore, athletes commonly use Sustanon to put on mass and size while increasing strength. However, unlike other testosterone compounds such as cypionate and enanthate, the use of Sustanon leads to less water retention and estrogenic side effects. This characteristic is extremely beneficial to bodybuilders who suffer from gynecomastia yet still seek the powerful anabolic effect of an injectable testosterone. The decreased water retention also makes Sustanon a desirable steroid for bodybuilders and athletes interested in cutting up or building a solid foundation of quality mass. Dosages of Sustanon range from 250 mg every other week, up to 2000 mg or more per week. These dosages seem to be the extremes. A more common dosage would range from 250 mg to 1000 mg per week. Although Sustanon remains active for up to a month, injections should be taken at least once a week to keep testosterone levels stable. A steroid novice can expect to gain about 20 pounds within a couple of months by using only 250 mg of Sustanon a week. More advanced athletes will obviously need higher dosages to obtain the desired effect. Sustanon is a fairly safe steroid, but in high dosages, some athletes may experience side effects due to an elevated estrogen level. With dosages exceeding 1000 mg a week, it is probably wise to use an antiestrogen such as Nolvadex (tamoxifen citrate) or Proviron (mesterolone). The use of Sustanon will suppress natural testosterone production, so the use of HCG (human chorionic gonadotropin) or Clomid (clomiphene citrate) may be appropriate at the end of a cycle. Sustanon 250 is a good base steroid to use in a stack. Athletes interested in rapid size and strength gains find that Sustanon stacks extremely well with orals such as Anadrol® (oxymetholone) and Dianabol (methandrostenlone). On the other hand, Sustanon also stacks well with Parabolan (trenbolone hexahydrobencylcarbonate), Masteron (drostanolone propionate), and Winstrol (stanozolol) for athletes seeking the hard, ripped look. Sustanon 250 is quite abundant on the US black market. One of the more common versions is the Russian Sustanon 250 manufactured in India. Thousands of these amps are smuggled into the East Coast of the United States where they are then made readily available to bodybuilders. Average price is around $7.50-$10.00 an amp, but prices as low as $2.50 an amp are available to some individuals who can purchase the amps as soon as they come ashore. The Russian Sustanon comes in plastic strips of five covered with a white paper and imprinted with blue ink. More recent lots of Russia Sustanon have the expiration date printed numerous times in purple ink going lengthwise in a line across the strip of five ampules. The ampules have a white paper label imprinted with blue ink. Don't be surprised if the labels are crooked or peel off easily. The labels on Russian Sustanon are commonly glued on crooked, and should peel off, but not in one piece. Also, don't be alarmed if the amps come loose without the plastic strip. The plastic strip is often thrown away to make it easier to smuggle the amps into the country. There is little need to worry about the legitimacy of Russian Sustanon. The World Anabolic Review mentions a counterfeit with rounded corners on the label, but this fake is rarely seen on the US black market. 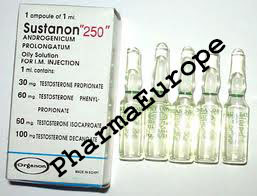 Another popular version of Sustanon is the Sostenon 250 rediject manufactured by Organon in Mexico. The redijects are very common to the southern region of the United States because they are frequently smuggled over the border after being purchased in Mexican pharmacies. The price for a Sostenon rediject is about $4.00 in Mexico. In the United States, they are often sold for $10.00 a piece. Each Sostenon 250 rediject comes packaged in a plastic tray with a foil covering. The World Anabolic Review shows a picture of a rediject with the needle attached. This picture is outdated because Organon recently began manufacturing the Sostenon 250 redijects without the needle attached. The redijects are often favored by many because of their difficulty to counterfeit. However, recently, bodybuilders have complained about some underdosed redijects circulating on the black market in Texas. Fortunately, these underdosed redijects do not seem to be widespread. In the meantime, the chances of getting a fake rediject are still very slim. Less common, but still seen on the US black market are the European versions of Sustanon from countries like Italy, Portugal, and England. All of these amps are scored and have a white label that is difficult to peel off. The amps and boxes should have the lot number and expiration dated stamped on it.